New research indicates that one of the largest fresh-water floods in Earth's history happened about 17,000 years ago and inundated a large area of Alaska that is now occupied in part by the city of Wasilla, widely known because of the 2008 presidential campaign. The event was one of at least four "megafloods" as Glacial Lake Atna breached ice dams and discharged water. The lake covered more than 3,500 square miles in the Copper River Basin northeast of Anchorage and Wasilla. The megaflood that covered the Wasilla region released as much as 1,400 cubic kilometers, or 336 cubic miles, of water, enough to cover an area the size of Washington, D.C., to a depth of nearly 5 miles. That water volume drained from the lake in about a week and, at such great velocity, formed dunes higher than 110 feet, with at least a half-mile between crests. The dunes appear on topographical maps but today are covered by roads, buildings and other development. "Your mind doesn't get around dunes of that size. Obviously the water had to be very deep to form them," said Michael Wiedmer, an Anchorage native who is pursuing graduate studies in forest resources at the University of Washington. 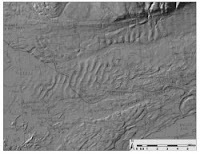 Wiedmer is the lead author of a paper describing the Wasilla-area megaflood, published in the May edition of the journal Quaternary Research. Co-authors are David R. Montgomery and Alan Gillespie, UW professors of Earth and space sciences, and Harvey Greenberg, a computer specialist in that department. By definition, a megaflood has a flow of at least 1 million cubic meters of water per second (a cubic meter is about 264 gallons). The largest known fresh-water flood, at about 17 million cubic meters per second, originated in Glacial Lake Missoula in Montana and was one of a series of cataclysmic floods that formed the Channeled Scablands of eastern Washington. The megaflood from Glacial Lake Atna down what is now the Matanuska River to the Wasilla region might have had a flow of about 3 million cubic meters per second. Another suspected Atna megaflood along a different course to the Wasilla region, down the Susitna River, might have had a flow of about 11 million cubic meters per second. The researchers also found evidence for two smaller Atna megafloods, down the Tok and Copper rivers. Wiedmer, who retired from the Alaska Department of Fish and Game in 2006, began the research in 2005 when he discovered pygmy whitefish living in Lake George, a glacial lake 50 miles from Anchorage. The lake has essentially emptied numerous times in its history and was not thought to support much life. Examination of physical traits indicate those fish are more closely related to pygmy whitefish in three other mountain lakes, all remnants of Lake Atna, than they are to any others of that species. Their existence in Lake George, some distance from the other lakes, is one piece of evidence for a megaflood from Lake Atna. "Lake Atna linked up with four distinct drainages, and we think that helped it act like a pump for freshwater organisms," he said. The megaflood also could explain some of the catastrophic damage that occurred in the magnitude 9.2 Great Alaskan Earthquake of 1964. Wiedmer noted that much of Anchorage is built on marine sediments, and one layer of those sediments liquefied and collapsed, allowing the layer above to slide toward the sea. As the upper layer moved toward the water, structures built on top of it collapsed. Though the marine sediments extend about 200 feet deep, the failure only occurred within a narrow 3-foot layer. Scientists later discovered that layer had been infused with fresh water, which was unexpected in sediments deposited under salt water. The ancient megaflood could account for the fresh water. "We suspect that this is evidence of the flood that came down the Matanuska," Wiedmer said. "The location is right at the mouth of where the flood came down, and the time appears to be right."